It's very likely that a new bull market has begun. 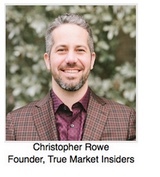 In the coming months, we hope and pray for bad news to knock prices down, creating buying opportunities. Because right now we are seeing the same technical action we've seen in past stock market long-term recoveries. It sits near the lowest point for some time, wiggling around, trying to figure out what it wants to do next. This process causes a bunch of highs and lows to form, as the market zigs-zags around. It then moves clearly above all of those zig-zag highs and lows. (Sometimes this takes two tries). This process just happened. And that means stocks are likely to go into bull-mode for the long-term. What I described, above, has happened with a large number of indicators. 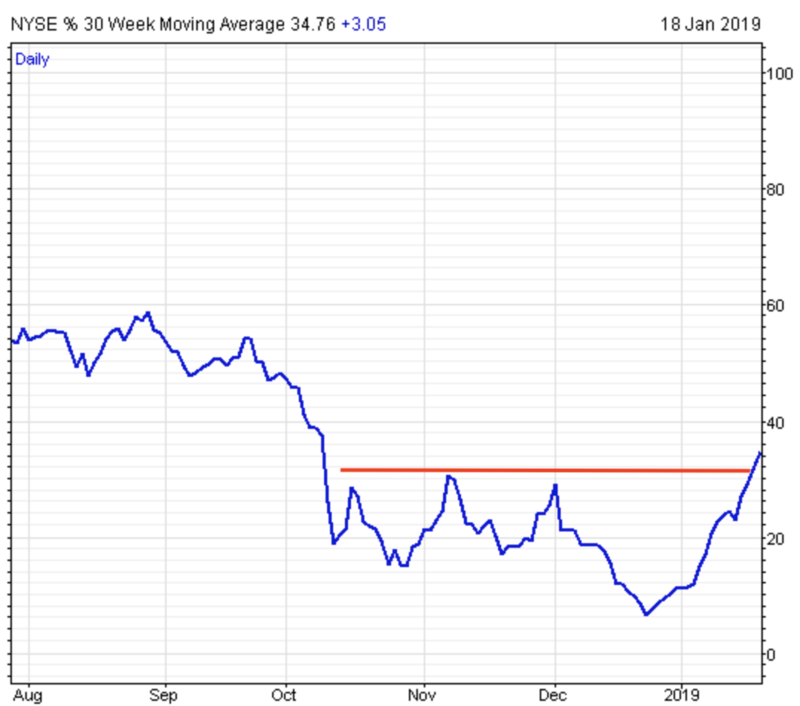 But today, I'll focus on one of the most powerful technical indicators, when it comes to timing: "The percentage of stocks trading above their 30-week moving averages". On the other hand, let's give my fingers a break and just call it the "%30-wk", shall we? I'll explain this chart in further detail, but let's keep it high level, at first. 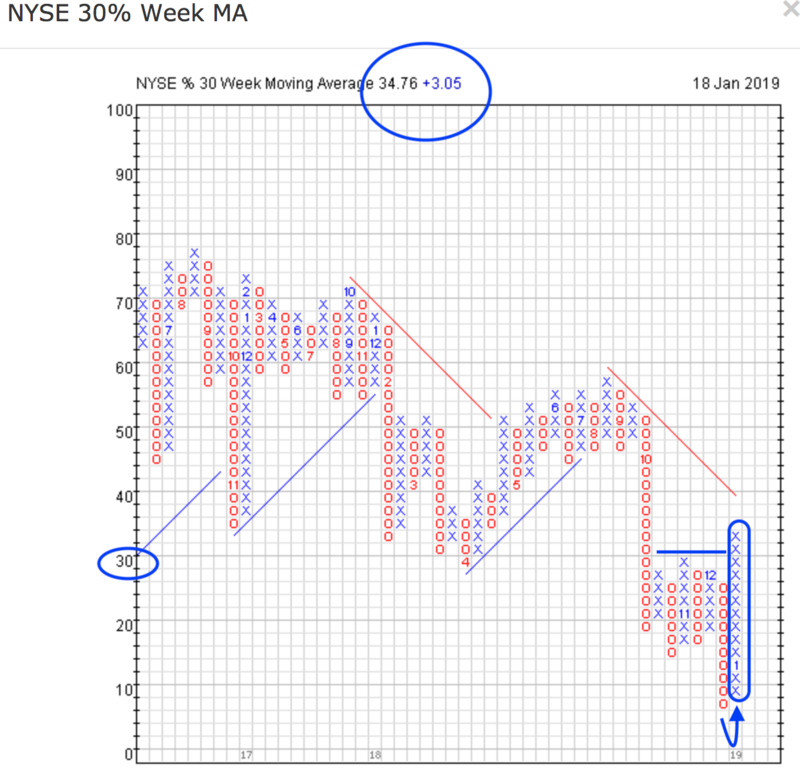 In the chart, above, the %30-wk is plotted as a "point and figure chart". We prefer using this type of chart for many indicators because a P&F chart only moves when something very significant happens. This is useful, because you don't want an indicator constantly saying "Buy... No, SELL... No! Wait... BUY! ... No, No... Wait... I meant SELL!" P&F charts help us to avoid trading based on "false signals". The signal we are seeing here, and in many other indicators, is very big and very clear. The far right column is the most recent column. When the indicator is going up, it posts an X-column. And when it's in decline, it posts an O-column. You can see what I described earlier. There's a recent major low, followed by a lot of zig-zagging up and down (congestion among the X and O-columns) as the market figures out what it wanted to do next. Notice that the indicator got as low as the 8-box! Meanwhile, the indicator tends to show great long-term buying opportunities when it's below 30, and when it's below 20 the market is deeply oversold. As mentioned, after the zig-zagging at a major historic low point, the indicator sliced above all of the zig-zagging with a single X-column (an uninterrupted advance). If you understand what stock market activity causes the indicator to do this, then you're likely convinced that it's a major sign of strength. If you know your stock market (and indicator) history, then you know this spells a likely new bull market. Here's a chart of the S&P 500, dating back to mid-2009 (just after the bear market bottom). The green arrows point to the last few times we got a similar signal. I can go back several decades and show you all the others. But let's keep it simple. The same behavior you just saw in the %30-wk was also seen at the 2009 low (not shown), which was a certified bear market low. It was seen again after the flash crash of 2010, which was considered a correction. And again, after the 2011 low. The same behavior was seen after the Jan 2016 low. The 2011 low and the 2016 low were very similar market-situations to the current one. SIDE NOTE: You'll do much better in the stock market if you stop thinking in the terms the financial media tries to program you to think in. 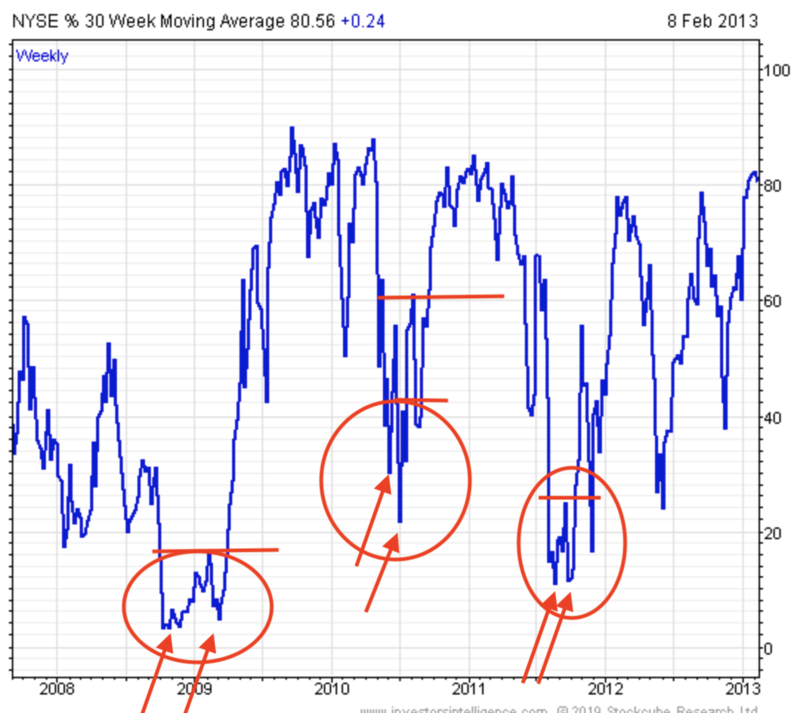 Instead, view the 2011 low as a "reset" of the stock market. (Basically, the previous bull market ended and the next one began.) We saw another "reset" in early 2016. This is when the market is very "washed out" (oversold), and gains a new life after the clouds part and the sun comes out. Our view is the last bull market has ended. And not because the S&P 500 declined by more than 20% from it's high, as the crazy market robot-pundits say. But because we were washed out - dramatically. Let's check out the history of this indicator. I'll re-post the P&F version so you don't have to scroll up. Then I'll post the line-chart version of the same exact data, to fit more history onto the chart (and to help out those who don't get P&F charts). The first line chart packs in 20 years of data, so the details might be hard to see, but I felt I should show it to you anyway. The low readings are at major bear market bottoms, or deep market corrections. Notice the pairs of red arrows, indicating a "double bottom" for the indicator, just like in today's situation. Now I'll chop it into pieces and instead of showing daily closing values, I'll show weekly closing values to make it easier to see. In early 2016, we got the double bottom (congestion), followed by a sharp break above all of that congestion. This happened at a higher level than the most recent occurrence, which is GREAT for current buyers. Many investors will feel like they missed the big rally, but look at how far down we got, when compared to historic occurrences. We are much lower than usual, so there is likely a lot more upside to come. Again and again, we see a double bottom (congestion) followed by a sharp advance in the indicator. You can do your own detailed comparison to the S&P 500... or you can take my word for it that each time it did this, it was the beginning of a new bull market. OK. But what the heck is the "%30-wk"? It's actually one of the only indicators named for what it literally is: "The percentage of stocks trading above their 30-week moving average". Here are three long-term charts with the (blue) 30-week moving average superimposed on the price chart. Stocks in an up trend tend to find support around the 30-week moving average. Stocks in a down trend tend to find resistance at the 30-week moving average. When a stock reverses its long-term directional trend, it will make a strong move above/below the moving average. The "%30-wk" looks at all of the stocks in a particular group and tells us what percentage of them are above theirs. The indicator we chose to analyze is the New York Stock Exchange %30-wk, which considers all stocks listed on the NYSE for its reading. Looking at what each individual stock is doing can be quite cumbersome, and the net totals are impossible to remember. But when we condense all of the data into one number -- the percentage of stocks above their 30-week moving average -- the result is a "breadth indicator", also known as an "internal indicator". 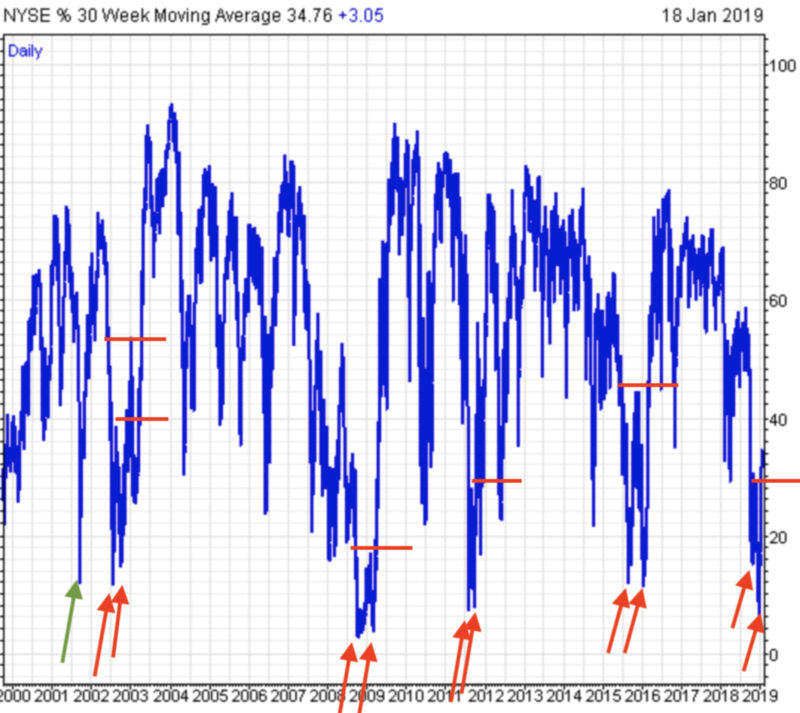 When the reading is low, we know the vast majority of stocks are below their 30-week moving average. When it spikes higher, we know that a large number of stocks, all at the same time, have crossed above their 30-week moving average. And when the reading breaks above a point of congestion, as it just has, we have a big clear picture of increased demand in the stock market. Because, suddenly, more stocks are now above this key moving average than have been throughout the entire market decline, between October 10th and now. We can see the percent of stocks above their 30-week made three attempts to advance at 28.7%, 30.6% and 29.1%. But now we have a reading of 34.76%, showing that we have more stocks participating in this rally than on any of the previous ones. And in the grand scheme of things, the reading is still pretty darn low! That means, although there are sure to be some selloffs, that knock down prices and send the bearish analysts into their television studios... those selloffs should probably be viewed as buying opportunities.